A workflow consists of an orchestrated and repeatable pattern of business activity enabled by the systematic organisation of resources into processes that transform materials, provide services, or process information. It can be depicted as a sequence of operations, the work of a person or group, the work of an organisation of staff, or one or more simple or complex mechanisms. Workflow defines tasks to be performed in a defined order by specific people or a computer. We can describe most of the repeating business activities as a list of tasks performed in a defined order. Request approval for a paid time off. Send an invoice to the client and receive payment. 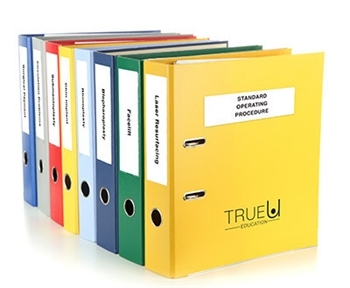 Process an expenses report from employees. Process quote requests submitted on a company website. A common way to document a workflow is a flowchart diagram. But flowchart is not the only way. You can define most business workflows as a list of steps to take. In some cases, the same employee (or a computer) performs all tasks and you do not need to show assignees. In some other cases, any of employees from the specific department can work on the task. For example, any HR department employee can take the task to work on it. Most business workflows include tasks for people from different departments as well as tasks for computers (like generating documents, updating calendars and sending emails). Why should you use workflows in your business? As you can see we need workflows to orchestrate the work of multiple people and to automate tasks done by a computer. Most businesses use workflows in some way. These could be in a form of emails with instructions for employees, written SOPs or checklists. Numerous researches show that businesses that are using processes are more successful. The Aberdeen Group discovered that 95% of top-performing organizations leverage business-driven workflows. Wonder why do most of the top-performing businesses are using workflows? Managers and employees involved in a workflow can instantly see the status of every ongoing process making it completely transparent. If anything is late or stuck – we can notice it right away and address properly. Workflow automatically routes all documents, files, and data between tasks and people. Once a person has finished their part, workflow immediately passes results of their work on to a next step. When business workflows are clearly defined you will have much less useless emails clogging employees’ inboxes. Everyone will have clear instructions on what they should do, how, when and in what order. Training new employees when business is growing fast is a major challenge. But when you have your workflows defined and described it becomes an easy task, since new employees have rules to follow and do not need to gather informal wisdom about how to perform their duties. Moreover, their work is transparent and visible to a team so it is easy to spot and correct any mistakes quick. Send documents by email for signing. Save signed documents to a Google Drive. Add a new appointment to a calendar. Send a welcome email to new employees. Request approval by CFO on all purchase requests above $10,000. Generate a new contract based on client’s data and send for signing. How to properly describe a workflow? Before you can actually gain all these benefits, you need to describe workflows and make them easily available to your employees. You could use a flowchart diagram or a list of tasks to document all steps and their order first. Instructions on how to perform every step. Who is responsible for each task (usually referred to as task’s assignee). A simple checklist may be sufficient at the very beginning or for very simple workflows. But in a real world, you most likely will want to add more information. Due dates for every task. Data and documents that should be provided and used on every step (usually as a form with fields to be filled in on every step). Data and documents needed to perform every step. For optional steps only: conditions that should be met. When you include all these details in your workflows describing some business-related activities – it’s common to refer to these as “business processes” instead of a “workflows”. The whole approach of managing business operations using business processes is referred to as “Business Process Management” or, in short, “BPM”. With so many details required for every single task, you can imagine how complicated a document describing a real-world workflow with 30 or 50 tasks could be! Forcing employees to read all these documents, remember them and follow updates is close to impossible. Fortunately, simple tools designed specifically for describing, managing and automating business workflows and business processes are available. 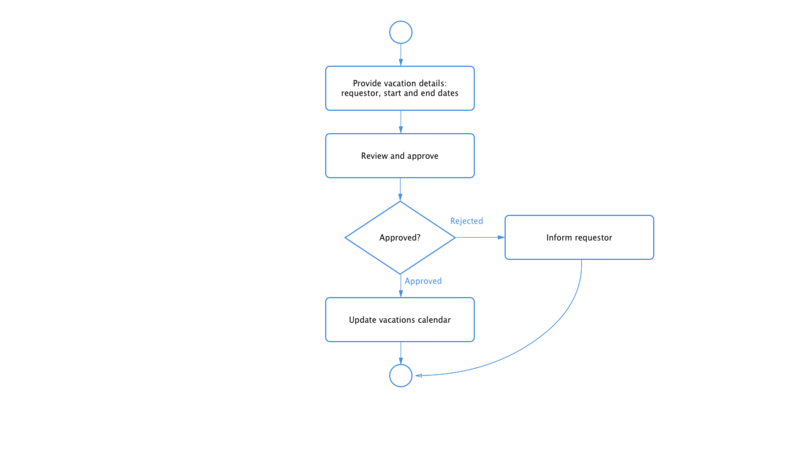 Let see how we can describe a simple Vacation Approval Process using Metatask. The process description is named a “template” in Metatask. So we will start by creating a new template named “Request paid vacation”. Next step is to create a form to collect information needed to handle this kind of requests. Requestor – to record information about employee requesting vacation. Direct manager – to record information about the manager who needs to give approval. Start and end dates of a vacation – these should be provided by the requestor. Now let’s assign every task to a proper person or a department. Note how we assign approval task to a direct manager selected in a form by the requestor. Rest of tasks we will assign to the HR department. As the last step, we will set due dates for each step to make sure that employees are working on a process in a timely fashion. For every task, we will give one working day to complete it. Notice, that we use business days in this example instead of a calendar days to properly calculate and set all due dates. At this point, we can start using our new business workflow. Let see how an employee can use this to submit for approval a request for vacation. When you just starting it may be a bit overwhelming to collect all the necessary info and lay out a simple but complete list of tasks. Should you create a lot of very detailed steps or less high-level tasks? What information is provided on each step? Use these 6-steps to approach documenting any process. 1. Describe the process as it works today. Do not day-dream of how it should work, instead always start with describing how the process works right now, in a real life. You may need to gather people from different departments to find out details. In this case, remember to involve not only those who oversee but also people who actually do perform tasks. 2. Use a simple numbered list of steps. Always start with a simple numbered list of steps, even if you imagine your process as a complex flowchart full of branches, loops, and conditions. Lists are much easier to understand. 3. Describe a full process flow. Full means it should include all possible steps, even optional. For example, if some clients need to make advance payments and some others are not, you should include the task “Receive advance payment”. And you should document when to use this optional task. 4. Describe a normal process flow. Describe process as it happens normally, under normal circumstances. It’s always possible that in some extraordinary circumstances you will need to handle things differently. It’s ok, you do not need to change your process for these rare cases. 5. Try to use the same level of details for all the steps. Your goal is to include all tasks important from a business standpoint. Keep your tasks so that for each of these you can appoint a single assignee responsible for its completion. Do not try to micro-manage, if you want to give very detailed instructions on how to complete some task, it’s better to include a checklist into tasks’ instructions. 6. Name your tasks consistently. Name tasks using the Process Manager’s point of view, even if the actual task is for the client. For example, use “Receive advance payment” instead of “Make an advance payment”.